Viking Ocean Cruises’ newest ship, Viking Sea, will be christened in London. The ceremony will take place when the ship is at anchor at Greenwich on May 5. The identity of the vessel’s godmother is yet to be revealed. 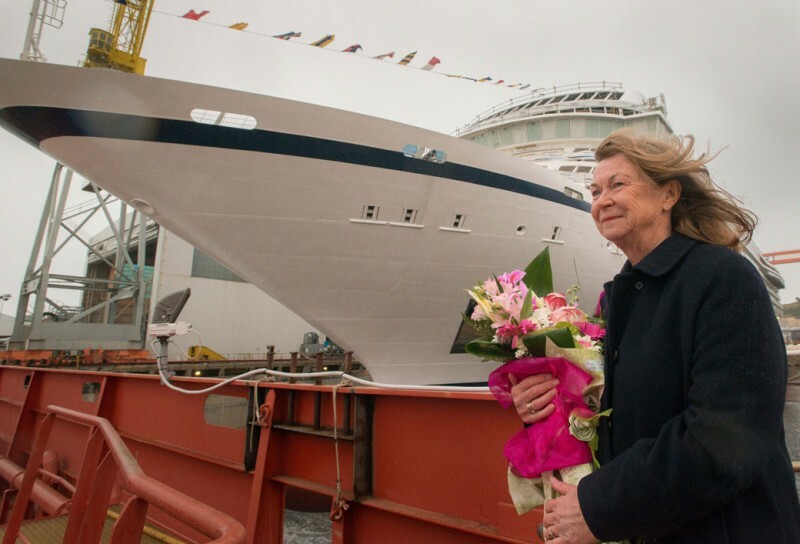 Sister ship Viking Star was named in Bergen last year, with the city’s mayor doing the honours. A lavish concert featuring Norwegian singing stars, and a spectacular firework display, brought the day’s events to a close. The 930-passenger Viking Sea is the second of six almost identical ocean ships being built for the company that dominates European river cruising. The third, Viking Sky, is under construction in Italy and was floated out of dry dock for the first time earlier this week. The madrina who took part in a ceremony to weld coins beneath its mast was Marit Barstad (above), sister of Viking chairman Torstein Hagen. An order for three more ocean ships was confirmed this week. They will be delivered in 2017, 2018, and 2020. Hagen said: “What a remarkable 12 months this has been, launching our first ocean ship, taking delivery of our second and preparing for the final outfitting of our third. I am proud of everyone at Viking and Fincantieri for their contributions. Viking claims to offer guests “the thinking person’s cruise” as an alternative to mainstream cruises. Ships are small to get guests closer to their destination, with more time in port, more overnights and fewer days at sea. Onboard, passengers find serene Scandinavian spaces, where every room is beautiful and functional, quiet and filled with light. All cabins have verandas and the ships offer the most al fresco dining at sea, often featuring regional cuisines. A focus on cultural enrichment brings immersive experiences onshore and onboard. In addition, Viking Inclusive Cruising provides a small ship experience at a big ship value—with every cruise fare including flights, a veranda stateroom, shore excursions in each port of call, all onboard meals. Passengers also enjoy many complimentary amenities as part of their fare, including: beer and wine with lunch and dinner service; premium dining reservations; Wi-Fi; self-service laundry; access to the Thermal Suite in the LivNordic Spa; and 24-hour room service. Viking Sea is scheduled to leave Istanbul on April 3, on the journey that will bring her to the River Thames in London. She will spend the summer cruising to the Norwegian fjords, Baltic Sea, and the Mediterranean. Following 18 months in Europe, Viking Star will make her Caribbean debut later this year.